As we prepare to celebrate our nation’s 234th birthday, let’s remember all who have sacrificed to make this day mean something to us…and those who have made it possible for us to celebrate it any way we wish… Happy 4th of July!!! This message brought to you by the veteran who owns Goin’ Postal of Tallahassee at (850) 692-3130, visit us on the web at http://gpoftallahassee.com, or drive to our store at 5810 North Monroe Street, Suite 210A, Tallahassee, Florida, and we can help you package your items safely and cheaply!!! I recently attended a showing of ‘Superman 3′ here at LSA Anaconda. We have a large auditorium we use for movies, as well as memorial services and other large gatherings. As is the custom at all military bases, we stood at attention when the National Anthem began before the main feature. All was going well until three-quarters of the way through the National Anthem, the music stopped. Now, what would happen if this occurred with 1,000 18 to 22 year-olds back in the States? I imagine there would be hoots, catcalls, laughter, a few rude comments, and everyone would sit down and yell for the movie to begin. Of course, that is, if they had stood for the National Anthem in the first place. 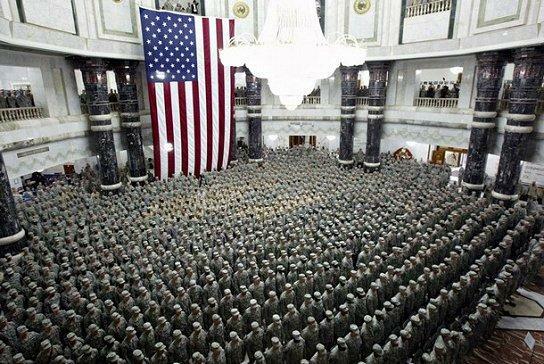 Here in Iraq, 1,000 Soldiers continued to stand at attention, eyes fixed forward. The music started again and the Soldiers continued to quietly stand at attention. But again, at the same point, the music stopped. What would you expect 1,000 soldiers standing at attention to do?? Frankly, I expected some laughter, and everyone would eventually sit down and wait for the movie to start. But No! !… You could have heard a pin drop, while every Soldier continued to stand at attention. Suddenly, there was a lone voice from the front of the auditorium, then a dozen voices, and soon the room was filled with the voices of a thousand soldiers, finishing where the recording left off: “And the rockets’ red glare, the bombs bursting in air, gave proof through the night that our flag was still there. Oh, say does that Star Spangled Banner yet wave, o’er the land of the free, and the home of the brave.” It was the most inspiring moment I have had in Iraq and I wanted you to know what kind of Soldiers are serving you. Remember them as they fight for us! Pass this along as a reminder to others to be ever in prayer for all our soldiers serving us here at home and abroad. Many have already paid the ultimate price. Written by Chaplain Jim Higgins. LSA Anaconda is at the Balad Airport in Iraq, north of Baghdad. This message brought to you by the proud veteran who owns Goin’ Postal of Tallahassee. You can reach us at (850) 692-3130, visit us on the web at http://gpoftallahassee.com, or drive to our store at 5810 North Monroe Street, Suite 210A, Tallahassee, Florida, and we can help you package your items safely and cheaply!! !